When You're Ready to Sell Your Gold or Silver, the U.S. Gold Bureau is Ready to Assist You! The U.S. Gold Bureau is committed to offering our clients access to the best precious metals products available on the market, including bullion bars and coins, raw proof coins, Investment Grade modern coins, and pre-1933 Investment Grade rare coins. We work to help select the top-performing products that will work to secure your portfolio and protect your wealth. An important consideration for any investment is liquidity -- how easy it is to cash out your investment when you're ready. Fortunately, there has always been a liquid market for gold, silver, platinum and other precious metals, so you will never have to worry about liquidity. To offer our clients even more comfort and security we offer a Buy Back Guarantee, which provides multiple options for investors wishing to sell a portion of their portfolio, or those seeking to divest their entire portfolio. Achieve the highest Open Market Price by selling your portfolio yourself. Since you control the price at which you're willing to sell, you decide what is right for you. This option has the potential of providing the highest maximum selling price, but will require additional energy on your part. Various online auction outlets are available, but you must account for the fees associated with using their services (typically between 15% and 20% of the sale price). Additionally, you must also be willing to dedicate the time needed to facilitate the transaction. There is no minimum hold required. Let us sell it for you, and we'll move your product(s) to the front of the line and sell it to the market through our trading floor. This option prices your portfolio based on our current market ask price, less an 18% fee, which covers all marketing, transactional, shipping and insurance costs related to selling the item to a new buyer. (You are responsible for the shipping and insurance fees required to deliver it to our facility, we'll cover everything from that point forward!) This is a great option for those seeking a reasonable value and who have time to allow us to sell their portfolio item(s) for them. This service is offered exclusively to U.S. Gold Bureau clients who have held their investment for a minimum of 60 months from the original date of sale. Consignment Sales are only valid for Gold American Eagle Proof 70 Sets, Silver American Eagle Proof 70 coins, Platinum American Eagle Proof 70 Sets and 1oz coins (for years when no Sets were minted), Gold American Buffalo Proof 70 coins, and Investment Grade diamonds. We do not offer this service unless you purchased the portfolio item(s) from us originally. This option is best for bullion metals, but also offers immediate liquidity for Investment Grade and numismatic coins. We will Buy Back your metals at our current bid price. If you want to sell quickly, this option is available to facilitate your requirement for immediate liquidity with zero fees or charges from us (You are responsible for the shipping and insurance fees required to deliver your metals to our facility). Generally speaking, bullion metal products are usually sold under this option because the price we generally offer for immediate liquidation of bullion is the same price you could achieve under options 1 and 2 above, before fees. This option is also available for Investment Grade Coins and numismatic coins, but will usually yield a lower price than options 1 and 2 above. There is no minimum hold required. With this guarantee we will provide you exclusive access to our trading floor (Option #2), or agree to Buy Back any coin or bullion product that we sell, at the current bid price (Option #3). Option #3 has no minimum hold time and is available at any time, for any reason. No questions asked. In addition, all transactions are protected by our standard Terms & Conditions of Sale or, in the case of a Consignment Sale, our Consignment Agreement. If you have any questions, please give us a call at (800) 775-3504. 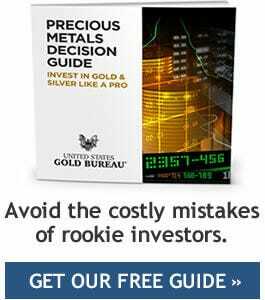 We're here to assist you with all of your precious metals investing needs.